Montreal, Canada (March 1, 2018) AlazarTech, a manufacturer of high-performance, low-cost PC Based Instruments, today announced the release of ATS9120®, a dual-channel 20 MS/s, 12 bit waveform digitizer based on the single-lane Gen1 PCI Express bus. ATS9120 features two simultaneous analog input channels that can each be sampled at rates up to 20 MS/s with 12 bit vertical resolution. Each channel has 10 MHz of full power analog input bandwidth. With software selectable attenuation, users can achieve an input voltage range of ±40 mV to ±20 V. ATS9120 uses an on-board FIFO to temporarily store ADC data before DMAing it to motherboard memory. “ATS9120 is our first step towards offering a more powerful, but still low-cost alternative to our PCI bus based digitizers.”, stated Muneeb Khalid, President of AlazarTech. “ATS9120 can not only replace ATS310 in customer applications, it also provides data streaming capability, which is a feature the ATS310 did not have”. OEMs can integrate the ATS9120 PCI Express digitizers into their own systems very easily using the Windows and Linux compatible ATS-SDK Software Development Kit. This SDK includes sample programs written in C/C++, Python, MATLAB®, and LabVIEW®. 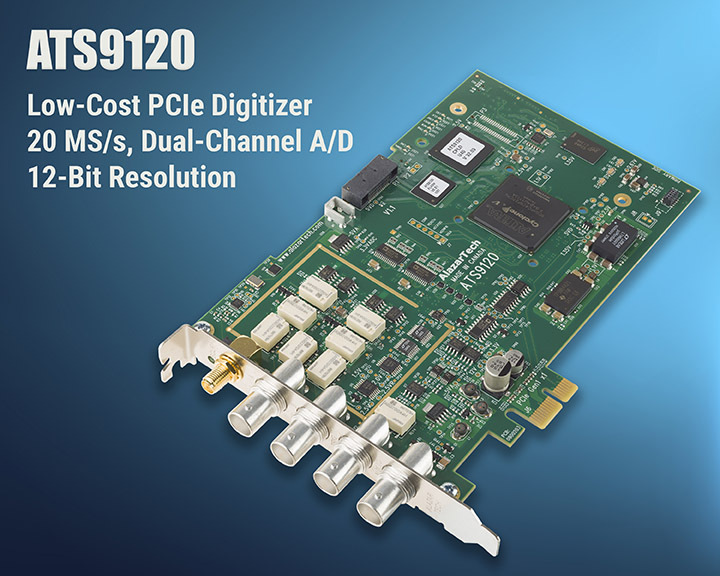 ATS9120 PCI Express digitizers are also compatible with ATS-GPU, a software library developed by AlazarTech that allows users to do real-time data transfer from ATS9120 to a GPU card at full bus speed. ATS9120 is available immediately from stock. U.S. prices start at $1,495 in single quantity. Volume discounts are available. International prices may be higher.